Some celebs wear flats constantly and still manage to appear completely polished (we’re looking at you, Alexa! ), even when dressed in their somewhat casual duds. Being big fans of flats ourselves (duh), we conducted our own sartorial investigation to decipher what it is that makes celebrities look so sleek in some of our favourite styles. And with the recent flats-banning controversy at the Cannes Film Festival this year, there’s no time like the present to discuss the foot-friendly kicks. Scroll down to see stylish celebs looking amazing while rocking their flats, and to shop our pick for each different type! This on-trend style looks exceptional with tea-length dresses. On Alba: Endless Summer Hannah Midi Dress ($189); Birkenstock Monterey Leather Sandal ($210). Pair these summer-ready shoes with structured separates so it doesn’t look like you’re headed to the beach (unless you are!). On Huntington-Whiteley: T by Alexander Wang Stripe Rayon Linen Short Sleeve Tee ($110); Paige Skyline Ankle Peg Skinny Jeans ($229); Balenciaga Classic Metallic Edge City Bag ($2125); Chanel shoes; Saint Laurent 52mm Retro Sunglasses ($395). 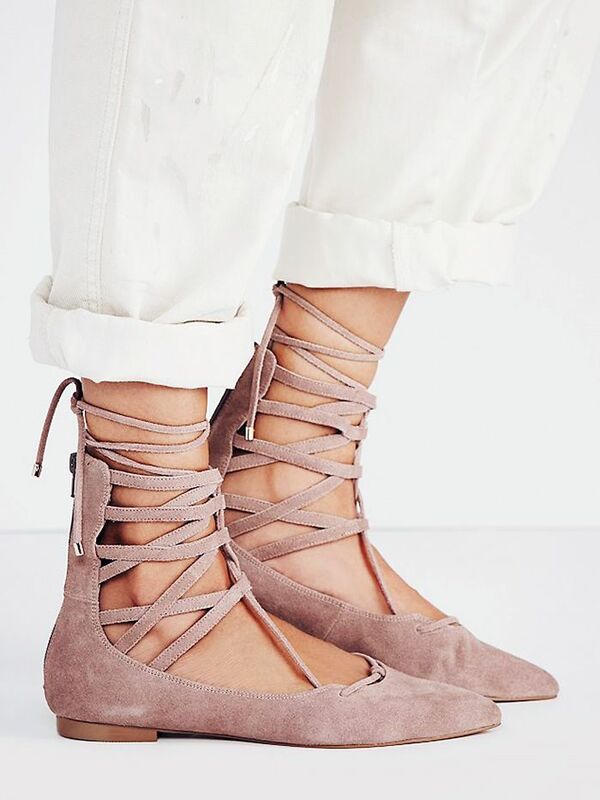 Want to avoid looking a little too juvenile in these feminine flats? Wear them with menswear-inspired pieces. On Chung: Alexa Chung x AG Brianna Skinny Jeans ($158); Carven shoes. Gigi Hadid, the reigning queen of sneakers, elevates her look by pairing the casual kicks with luxe accessories. On Hadid: Ripley Rader Jersey Lounger Jumpsuit ($158); Botkier Lafayette Satchel ($298); Adidas Originals Superstar Sneakers ($80); Victoria Beckham Modern Aviator Sunglasses ($550). Loafers are the perfect polished flats to wear to the office. For the most flattering Hepburn-esque look, wear them with cropped pants. These classics look the chicest when dressed up a bit, so pair with a shift dress or fit-and-flare skirt. Show a little skin to avoid looking dowdy. On Rossum: Rails Britt Sleeveless Button Down Shirt ($124); Gerard Darel handbag. What type of flats do you think look the most chic? Comment below!